Following up on both my recent post of Z.D.L. member Claus Van Bebber's Schallplattenkonzert and a host of other Z.D.L. 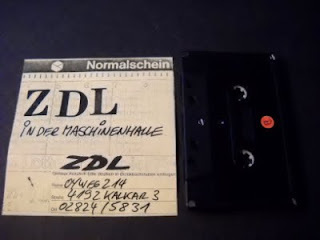 tapes that I upped in back in '07 (and yes, their name includes the periods on all their other releases), this live outing from Van Bebber and his Neue Deutsche Welle cohorts of the era relates most to the material heard on their "Nicht Als Heft. Verlangen" tape; the greyscale volleys of no wave-indebted thwack, clatter and harangue and the overall feverish atonal atmosphere placing this live outing within spitting distance of Einsturzende Neubauten.